Why I don’t use trekking poles!?! Trekking poles have swooped in and taken over the mountain hunting scene in North America and are starting to appear elsewhere as well. Trekking poles are a great tool when used in the right terrain and can save your knees and small falls. But there is a tool that far exceeds the uses of the walking pole while in the mountains. The axe. Ice axes are often seen as a tool for ice and climbers. This is true a lot of the time but a good quality walking axe has a huge variety of uses and it is this versatility that sees me carrying one every day I head into the hills. I got my first real introduction to axes when I started as a Glacier guide on Fox Glacier. We used custom made axes to smash a path and build steps and stair cases so clients can easily access the glacier and its features. These are handmade 3kg ice smashing beasts that take some time, skill and strength to master (they do go through boots quite easily, and your feet….). Watching a good guide carve a stair case in a matter of minutes is an amazing sight and true work out for the guide. I got used to carry an axe about and soon found myself wielding a basic 75cm walking axe where ever I went. The more days I spent carrying my axe the more uses I found for it. An axe makes a very solid walking stick and cannot be bent or broken easily like a trekking pole. I hunt some rather ‘questionable’ terrain when I am on my own and an axe adds a huge safety margin to the terrain I can access. Not only does it give me a chance to self-arrest should I fall but I can create foot and hand holds in not only snow and ice but soft rock and dirt which is often the most tricky terrain to move in. How many times have you wished there was another spot for your hands or feet??? There is a large assortment of axes on the market and they are not all created equal. I spend a fair amount of time using them for things they are not designed for so have tested their construction beyond what is ‘normal’ use. If you are looking at buying at axe look for one around 70-100cm long. The longer ones are hard to find but worth it if you are tall. Im 5’10” and find my 75cm just a little short but I am used to it. Stay away from alloy heads! Alloy heads may be lighter but are designed for clean snow and ice only and will soon fail(I have seen 2 of those extendable ice axe/trekking poles both with heads snapped off). Get a proper steel head and it will last and take all kinds of abuse. Most axes these days have alloy handles and these seem to hold up well. I have mine wrapped in tape to try and reduce noise/glare while hunting. A small leash is a great addition to an axe and makes it a little easier to hold onto. Step cutting is a skill and can only be learned the hard way (by actually doing it). When carrying your axe make sure the ‘pointy’ bit is facing backwards in your hand, that way when/if you slip you can easily self-arrest(if you don’t know what that means look it up!). Another simple tip that I see often is when sidling people keep their weight on the downhill side with a pole/stick. ALWAYS keep your weight on the uphill side when sidling, you want to be as close to the mountain as possible. And if you fall with your weight uphill you will gently sit down, if you fall with weight on the downhill side you are most likely to go head over heels. Walking stick, climbing places I shouldn’t, cutting steps in ice/snow/rock/dirt, making a flat camp ground, digging a toilet hole, cutting small bushes for trails/fire wood, snow/ground anchor for rope/tents/tarps, propping up animals for photos, shooting stick the list goes on! Make your own judgements and only push yourself and your gear as far as you feel safe. Your safety is your responsibility and only yours. An axe is an easy to use tool that costs little, lasts and could well save your life. Well worth thinking about if you spend as much time as me in the rough country. Enjoy yourself in the mountains and most of all be safe and have fun! Owner/Operator of Hard Yards Hunting. 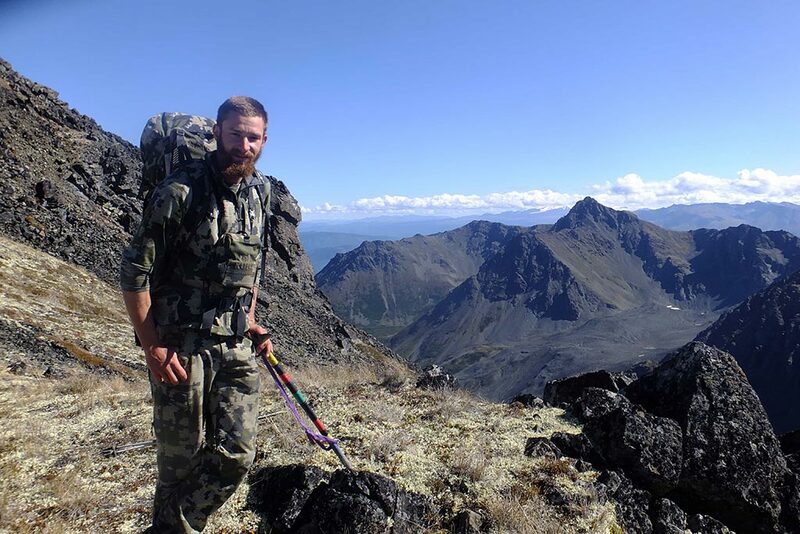 Mountain hunting, especially for Tahr is my true passion and I spend as much time as I can in the hills. When Im not guiding I am usually hunting for my self or testing gear. Kifaru Argali Review with 2018 updates! !